The SK brand has always stood for the exceptional quality, durability and innovation that professionals demand of the tools they make a living with. SK Hand Tool strives to make the technicians’ job easier as well as faster and provide tools you are proud to put in your tool box. That connection to you and what your tools mean to you is what is at the heart of SK Tool Corporation. SK tools represent the finest in American know-how. All sockets and drive tools, ratcheting wrenches and hand tools, are manufactured in the USA with a Limited Lifetime Warranty. tooldesk.com features Discounts on Sk Tools, the professionals choice of auto mechanics, homeowners and backyard DIY'S worldwide.. Tools by SK are skillfully crafted industrial and specialty tools. Most SK products are in stock and shipped within 24 hours. Warranty - 1-800-752-7263 SK tools unless otherwise specified, are unconditionally guaranteed against defects in materials and workmanship. SK will repair or replace any tool that fails to give satisfactory service, on the condition that the tool has not been abused or modified and that it is returned to SK Hand Tool Corporation. You can count on SK tool Corporation to stand behind their top quality professional hand tools. 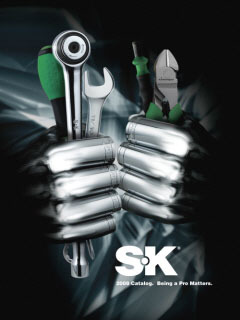 tooldesk.com is proud to be an authorized distributor of SK automotive tools. SK's SureGrip Hex Design on sockets and wrench box ends drives the side of the fastener, not the corner. This not only provides increased strength, but also avoids the rounding of rusted or damaged fasteners, which can occur when using a sharp cornered hex tool. SK's high polish SuperKrome® plating on chrome sockets, wrenches and drive tools results in a jewelry-like finish, providing ease in clean-up and long life, with maximum corrosion resistance. The unique nose-down design on many SK impact sockets provides better access to hard-to-reach fasteners. SK's new black coating on impact tools retains more rust preventative compound than black oxide. SK's swivel impact sockets feature extra recess depth to allow for use where threaded fasteners protrude above the nut or where the fastener is domed. The 30° flex angle on SK's swivel impacts allows the user to get at hard-to-reach fasteners. SK's top quality production grade retaining ring pliers are designed to be comfortable, easy-to-use, and most importantly, keep the retaining ring on the tip. The precision machined SureGrip® tip features a tapered area behind the edge of the tip, designed to keep the rings on the tip. Try these pliers once and you won't go back to utility grade retaining ring pliers. From molded plastic cases to new SureGrip® locking wrench racks, we continue to search for the best ways to package our products for professional tool users.